The summer heat is really killing me! My husband who just came back home to spend his home leave is also complaining about the extreme heat. It seemed like you don't have a comfortable place to stay inside the house. Well, turning the air conditioning on 24 hours a day could be an option, but can you afford to pay the huge increase in your utility bills? 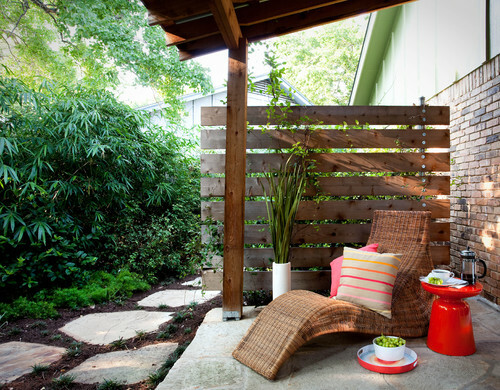 Creating a relaxing and cozy corner in your backyard could help. If you have that space in your yard, you can create an instant reading nook or just simply a space for you to relax and get a fresh air. You could choose that spot with lots of greens for a more added freshness and cooling effect. You do not need to buy anything to create your own cozy space. Using what you already have at home will be a wiser alternative. Go and scout for those unused chair or bench in the house, set up a small garden by using recycable containers and voila, you will be on your way to a relaxing afternoon nap or tea break. I Got To Do This!